Phylogenetic relationships among reptiles were examined using previously published and newly determined hemoglobin sequences. Trees reconstructed from these sequences using maximum-parsimony, neighbor-joining, and maximum-likelihood algorithms were compared with a phylogenetic tree of Amniota, which was assembled on the basis of published morphological data. All analyses differentiated α chains into αA and αD types, which are present in all reptiles except crocodiles, where only αA chains are expressed. The occurrence of the αD chain in squamates (lizards and snakes only in this study) appears to be a general characteristic of these species. Lizards and snakes also express two types of β chains (βI and βII), while only one type of β chain is present in birds and crocodiles. Reconstructed hemoglobin trees for both α and β sequences did not yield the monophyletic Archosauria (i.e., crocodilians + birds) and Lepidosauria (i.e., Sphenodon+ squamates) groups defined by the morphology tree. This discrepancy, as well as some other poorly resolved nodes, might be due to substantial heterogeneity in evolutionary rates among single hemoglobin lineages. Estimation of branch lengths based on uncorrected amino acid substitutions and on distances corrected for multiple substitutions (PAM distances) revealed that relative rates for squamate αA and αD chains and crocodilian β chains are at least twice as high as those of the rest of the chains considered. In contrast to these rate inequalities between reptilian orders, little variation was found within squamates, which allowed determination of absolute evolutionary rates for this subset of hemoglobins. Rate estimates for hemoglobins of lizards and snakes yielded 1.7 (αA) and 3.3 (β) million years/PAM when calibrated with published divergence time vs. PAM distance correlates for several speciation events within snakes and for the squamate ↔ sphenodontid split. 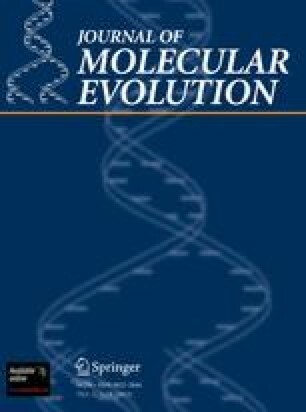 This suggests that hemoglobin chains of squamate reptiles evolved ∼3.5 (αA) or ∼1.7 times (β) faster than their mammalian equivalents. These data also were used to obtain a first estimate of some intrasquamate divergence times.